Disclaimer: This is more of a personal story, but it’s about how a family created something together, and since that’s what we are attempting to do with Rocketwagon, I think it’s okay to put it here. My daughter has been strangely unwell all winter and when people have asked me how we are doing the only way I know how to describe it is to say that I feel like I am Bilbo with the Dwarves, stuck inside the mountain, the door that they came in has been destroyed, and the only way out leads past the dragon’s lair, so they are just endlessly waiting in the darkness. And there’s no dragon down there, they just think there is, so they are terrified to go down and can’t go up. The only thing they can do is to sit and worry and wonder. My tunnel has had a whole bunch of chicken noodle soup and Advil in it. And days that seem to be exactly the same. I sit beside my sweet girl and I miss her. I notice when she smiles, I used to notice when she didn’t. I just stopped talking about it. I didn’t want to hear any more possible diagnoses, or suddenly cry when someone in Kroger asks me how she is. I think that’s when everything got so dark, and I began to forget what day it was. The Tunnel. And then a little group of Penguins showed up in my darkness. They held out their little flippers and invited me to come back out. I thought, “Not anymore, they aren’t,” and let the door slam behind me. 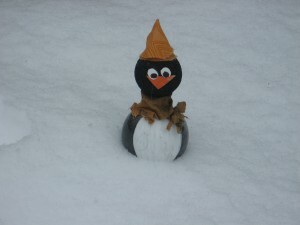 Over the next few days, Penguins began to show up. Running out the door for school, when Kalley was delighted (Mommy, look! Another one! ), I was unmoved (that’s nice, get in the car). Until the morning I had already found a new Penguin, then opened the door a few minutes later and found yet another (that had NOT been there before) halfway to my door. He looked so intent on finding a job, and he won me over. I brought him inside and examined him. His body was a dish soap bottle filled with black water, with a belly that was carefully painted white. His head was a black styrofoam ball with hot-glued on eyeballs and beak, and his little hat and scarf looked as if they had been sewed by someone who was experimenting with their first sewing machine. I immediately envisioned what had gone into creating this guy….paint, glue guns, eyeballs, cut-out beaks, first-time-sewer and fabric had created a huge mess in someone’s kitchen. I was stunned. This was not some silly prank; it was an act of love. I had been able to avoid the run-ins at Kroger, pretending that I didn’t need to go down that aisle or studying the fake list in my hand. I had gladly made use of the “silent” button on my phone. I was not, however, prepared to guard myself against a whole group of handcrafted arctic birds showing up in my yard asking for jobs. This was not on my radar, a vulnerable place in my carefully planned defense. The final penguin to appear offered not only an impressive cover letter and resume, but also an irresistible bribe (a gift certificate to ATavola, a restaurant that we can waddle to right down the street). I immediately gave him the management position, and consented to appoint the others to appropriate situations as well. When the final sign appeared, explaining that all of this was courtesy of the Zoeckler family, I texted Kristen that her penguins had awakened me from my self-imposed isolation and her response was, “We love you guys and could tell that you were hurting”. I sat there in my living room, tearfully thankful to have a friend who was willing to mess up her kitchen for us. And not only that, one who recognized that sometimes nonsense is necessary. Kristen and Geoff had commissioned their three girls with the task of being Secret Love Ninjas for a week. They had crept around the neighborhood on school nights for a ridiculous reason. It was absurd, preposterous, bizarre, and silly. And it was perfectly, beautifully RIGHT. I don’t know if nonsense is one of those Love Languages, but maybe it should be, because it’s totally mine. Corbett is still not herself, and some days I still wonder if if there is a dragon in our future. But when I remember that I don’t have to cower in the darkness alone, I feel brave. I feel loved. When you live in the tunnel, you start to forget who you are. Kristen had somehow understood that a ridiculous surprise would remind me. 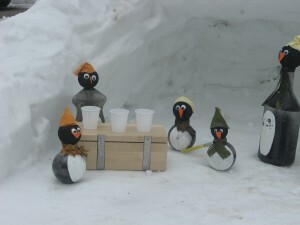 Those penguins stood in my yard and brought me back to the truth. I was humbled, comforted, and inspired. Our family’s main creative goal right now is to create another app together, but I would love to try out the Secret Love Ninja racket sometime. This means that the inspired part of this story may show up in your front yard one day. 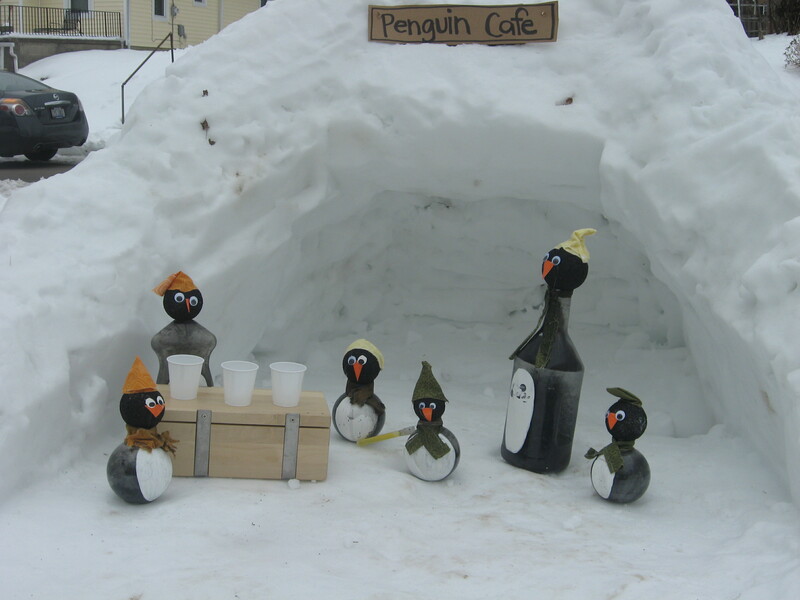 I am proud to say that our front yard is now the the site of the ONLY local Penguin Cafe (that I know of ). The service is very slow, most of the items on the menu contain fish (I was like “Fish Pancakes, No Thank you! !”), and the seating arrangements are slushy and cold. They do, however, serve hot chocolate (just ask them to hold the FISH) on snow days, which makes up for most of their aforementioned shortcomings.